Germany is a very interesting country to visit. During the past century, it endured two world wars, was split into two states, survived Communism, eventually unified and has now become a political and economic model for Europe. Berlin is the capital city of Germany. The beautiful Spree River flows through the heart of the city. 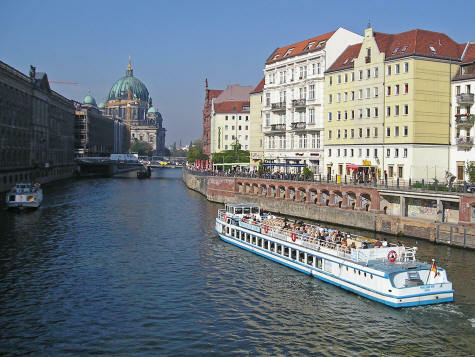 Visitors can enjoy a boat cruise down the Spree and and admire both its old and its new architecture. Frankfurt is Germany's fifth largest city. It is home to the massive Frankfurt International Airport which is one of Europe's three gateway airports for international tourists. The Rhine River Valley is a top German tourist destination. Visitors can take a river cruise and enjoy seeing dozens of castles that are perched on the hilltops along the river. Southern Germany is particularly attractive. The city of Munich in the state of Bavaria is a popular tourist destination, particularly during Oktoberfest. Don't forget to sample the Germany beer! Travelflicks is please to provide four free travel guides for Germany. Please access them from the menu.